Welcome to the first new reviews of the year. Today we cover some brand new Joe Lovano and a not quite as new John Zorn release: both deliver. This will be the first set of reviews to utilize the new Foresight and Afterthought stars system, the guidelines to which can be found here. 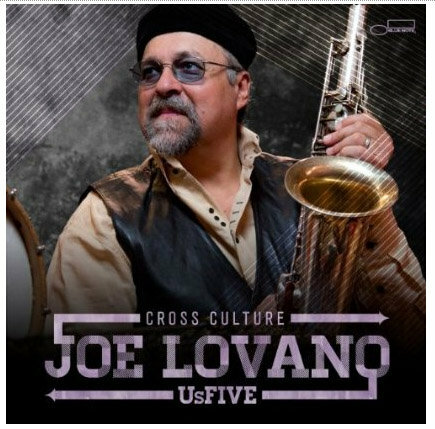 Joe Lovano has just released a new record with the workhorse band behind his last two excellent albums, the ‘Us Five’. Last time the Us Five, a double drum quintet with James Weidman on piano, Esperanza Spalding on bass and drummers Francisco Mela and Otis Brown III, tackled the Charlie Parker songbook, although in a way barely recognizable to the originals. This time the band takes on a much more expansive project, the “notion of a universal musical language”. Although this seems to me a rather nebulous project to take on, the result is undoubtedly successful. Cross Culture is possibly my favorite so far of the three Us Five albums. The band is slightly different this time around. Esperanza now shares the bass chair with Peter Slavov. Slavov may not have the name recognition Esperanza has, but I can find no fault with the bass playing anywhere on this album. I saw the Us Five play with Slavov a little less than a year ago and despite my initial disappointment at not seeing Esperanza found myself blown away. Also joining the album on some of the tracks is guitarist Lionel Loueke. The Us Five has excited in the past by subverting the feel of a normal jazz quartet by adding another drummer. Having drummers who are both simultaneously so capable but also so distinct as Mela and Brown are has led to some fascinating interplay. The conceit this time around is to try and incorporate world music elements, hence the inclusion of West African guitarist Loueke. Hence also a whole host of different instruments played by the inimitable Lovano. Lovano has always varied his albums up by switching between different saxophones, playing not just the more recognizable tenor or soprano saxophones but also rarer instruments like the C mezzo saxophone or the astounding, custom, double soprano saxophone called the ‘aulochrome’ which allows him to play two independent notes at once. This time he varies it up even more, often switching instruments, sometimes more than once, in the middle of an individual song. He also joins in on a number of drums from around the world; indeed the track ‘Drum Chant’ is mostly drum chorus from Lovano and the two full time drummers. The album is a lot freer and more abstract than previous outings. The opener, “Blessings in May”, is a fun, swinging romp and the one non-original, Billy Strayhorn’s “Star Crossed Lovers”, is a grooving, but respectful, ballad, but much of the rest of the album is much less ordered. The album closer, ‘PM’, is also a romp of sorts, but at times it involves five musicians romping in different directions at once. If that sounds like a criticism, it shouldn’t. This is a loose, grooving album, not despite, but because of the abstractions. Like Ravi Coltrane’s experiments with recording technology to give some of the tracks on his last album, Spirit Fiction, a sort of jarring sensation, Lovano lets his band mates loose to make noise, except, meaning no disrespect to Ravi, I think Cross Culture is more successful than Spirit Fiction was. Lovano’s compositions have a greater sense of progression, aided undoubtedly by effects such as his switching instruments or switching the instrumentation of the band by having different musicians lay out at different times. Loueke is the one component here I’m not sure what to make of. He is an excellent guitarist, to be sure, but he never really comes front on the album. Most of his playing is atmospheric abstraction behind or alongside Lovano. While his contributions undoubtedly involved a lot of improvisation, I don’t think he ever plays what you could call a ‘solo’. While he proves a fine sparring partner for Lovano he does at the expense of pianist Weidman; the two rarely play at the same time. John Zorn’s most recent addition to his mystical series, The Concealed, doesn’t have the improvisatory abandon that Cross Culture can demonstrate, although it does have the world influence. John Zorn, lunatic genius, has had an incredibly diverse set of projects over the years. From his avant garde take on Ennio Morricone, or his Ornette Coleman meets Klezmer ‘Masada’ family of groups to his even wilder compositions, he has tackled everything from the noisiest free jazz to surf rock at some time. Recently, he has also put out a series of albums dedicated to the exploration of melody, of which The Concealed is the most recent, and one of the best, releases. Tackling Zorn’s compositions here is a dream team of sorts of frequent Zorn collaborators. At the drums is Joey Baron, perhaps most famously of the original Masada group, as well as its electric counterpart, and Zorn’s much milder ‘Dreamers’ group. Fabulous bassist Trevor Dunn and vibraphonist Kenny Wollesen also join from Electric Masada, the Dreamers and a host of other projects. Frequent string collaborators Erik Friedlander on cello and Mark Feldman on violin, both in the Bar Kokhba band, fill out the front line. Rounding out the band is pianist John Medeski. The emphasis here really is on composition. Most of the tracks are relatively short (for a ‘jazz’ album at least), with the longest clocking in at around six and a half minutes and while Medeski and Wollesen display some considerable improvisatory chops at times, I get the feeling this project isn’t designed for the musicians to really dig in and explore. Instead, what really comes through is Zorn’s melodies and his feel for the nuances of this band. Zorn is exploring Middle Eastern and Hebrew musical concepts in a modern setting and this band tackles the material masterfully. My favorite track is ‘The Dervish’: just listen to the atmospheric glissando the strings bring to the beginning of the song, the dancing melody and the counterpoint from the piano. It also contains two excellent solos from Medeski and Wollesen, made even better by what Zorn has composed for the rest of band. Medeski’s solo begins with Wollesen providing punctuation, and the music slowly swells, Dunn starts walking double time and the drums begin to pick up. Then the strings come in, softly at first, but rising and rising. It has an excellent effect. The album also has two excellent solo compositions, highlighting Friedlander on ‘The Silver Thread’ and Medeski on ‘The Way of the Sly Man’. ‘The Way of the Sly Man’ is a particularly spectacular piece of musical syncretism. It is a piece of Hebrew music played in the style of a New Orleans funk, as if Dr. John decided to take up Klezmer. Of Zorn’s softer and melodic works, this ranks among the best. Four Stars.